How does the relationship with your readers change when you make your webcomic an explicitly part-time job? Over the last decade there has been an implicit contract made between a webcomics author and their intended audience. "I update regularly, and in exchange you support me through encouragement, word-of-mouth advertising, and purchasing merchandise." Because this contract is implicit, however, the commitment between author and audience is a bit fuzzy. If the cartoonist feels that the project has run its course or that it's not reaching the intended goals, they can retire the project without much fuss. After all, everyone was getting it for free. As more cartoonists use Patreon or Tapastic's Support Program to subsidize their webcomic, the contract becomes a lot more explicit. Introducing support tiers and rewards creates an even more clear commitment to an audience. You're saying "This webcomic is now my part-time job, and (maybe) I hope to make it a full-time job." But a traditional part-time job, even one you take on just to make some extra income, usually promises a well-defined amount of payment. With services like Patreon and Tapastic you're making the commitment to show up for the job, but there is no promise of any specific amount of pay. So to whom are you committing? Are you committed to reaching a certain monetary goal first and foremost? Or are you committing to servicing an audience with the hope of reaching a goal? And if you fail to reach that goal, how do you navigate the friction of quitting when you've already made an explicit promise to that audience? 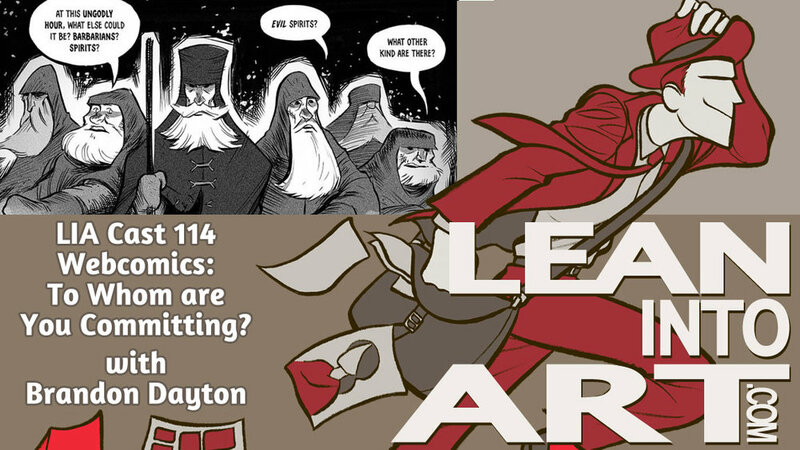 Join us for a Lean Into Art Cast with guest +Brandon Dayton. Brandon has been navigating these concerns with his new Green Monk webcomic, and together we'll explore how things change when you make your webcomics intentions a lot more clear to the public. Rob has the week off, but he'll be back next episode! Note about this episode - normally we have a video to share with the audio version of the podcast - I'm sorry we don't have that this time. Technical difficulties made video recording impossible, and for that we apologize!